I set out Patriotic decorations from Memorial Day until after July 4th. I even put small flags in my potted plants in honor of Flag Day! I spend the most time making a centerpiece for my tables. Last year, I created a centerpiece out of some blue dishes, a Christmas tray, and a flameless candle, see here. When I was getting out my decorations this year, I wanted a simpler centerpiece. I decided to go with star-shaped candles. We get into trouble when we try to make each year bigger and better than the last. We spend more money, more time, more effort, but get a smaller return. Sometimes, we find we have just run up the credit card bill. If I am in the mood for an extravagant dinner party, I will iron the napkins and tablecloths and get out the china. But sometimes, life is just busy and I will use paper plates. Other times, I use my every day dishes and jazz up the centerpiece. My point is every holiday dinner does not have to be perfect…or formal. Sometimes we just need to keep it simple. The most frugal thing you can do is Use What You Have! P.S. I made the runner in the photo. I just laid another runner I liked over the material and cut it out with an extra inch all around. I sewed it together and quilted it by hand. I used two different materials, a scrap of quilt batting, and made it reversible. 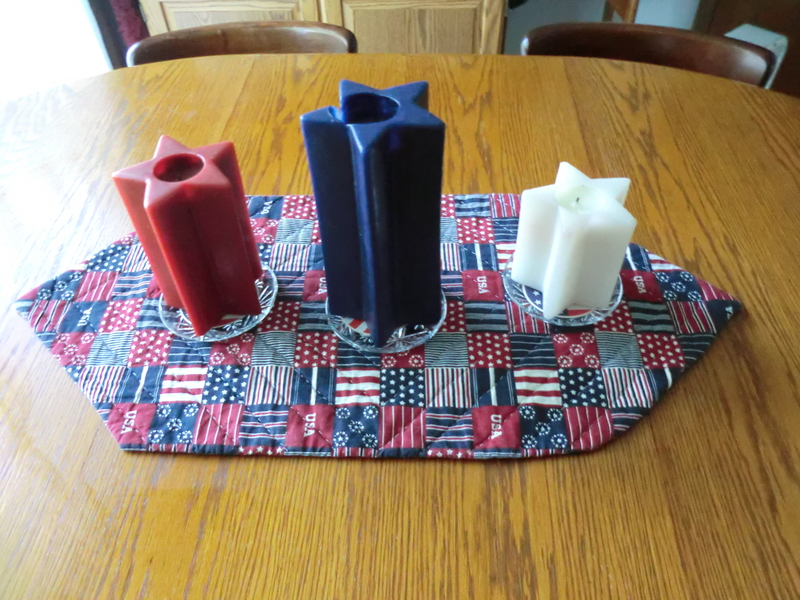 My 2015 Patriotic centerpiece with my homemade runner. This entry was posted in Decorating, Make It, Use What You Have and tagged Make It, Money Saving Ideas, Patriotic, Use What You Have by Frugal Fish. Bookmark the permalink. I don’t decorate as frequently as you say you do for the holidays, but every now and then I want to do something simple to make the space festive. I don’t like spending lots of money on these types of decorations so I usually make them myself! Check out the latest one I did on my blog! Thanks!